Rated 5 out of 5 by biscuitsmama from SOMEONE SHOULD HAVE TAKEN THE QUEEN’S MIRROR AWAY! WOULD’VE SOLVED A LOT OF PROBLEMS Dark Romance Winter Lily is game number eight in the series. Winter Lily is loosely based on the story of Snow White and is told through the eyes of the two main characters Lily, the Princess of Winterhelm, and William the King of Lanceya. Wicked Queen Nivella is having another meeting with her famous mirror wondering what it will take to stop her aging curse so that she can gain eternal youth. The Mirror tells the queen that only the purest heart can break the curse and make her eternally young. Thus starts another of the wonderful Dark Romance games. I could go more into the storyline but I think most of us are familiar with the tale of Snow White but what makes these games so much fun is the viewing of the story as it unfolds and is told by each of the main characters in turn. This is a beautiful game and one that I’ve been waiting to play. I love the fairy tale types of games as most of them are not at dark as some recent games, however, the developer does have a go at adding some darkness to this tale. I love this game and the storyline that has me enjoying each new character I meet along the way. Well, the fairy might be an exception with her high-pitched, squeaky voice that I truly find grating. I think one of my favorite characters is Prospero the alchemist. If you play a lot of Domini games then you will know there is really nothing different to be found in the HOPS. We have the now expected variety with storybook, silhouette, and list types included. Even with nothing new, the HOPS are fun and the items are not so small that I want to rip my eyelashes off as I look through a magnifier to spot them. The puzzles are fun and mostly easy even on the “Hard” setting. The puzzles include a lot of my favorite ones but with 18 of them in the game I am not going to list them. A couple of other reviewers do an excellent job of providing that information for you. As much as I appreciate what they do, I happen to love surprises and would rather figure it all out as I go along and then do a happy dance when I find a puzzle I really like. If you prefer the Collector’s Edition of a game, this one includes various collectibles including Dwarven Artifacts to store in the Dwarven Museum, Chess, Pieces to complete a chessboard, and Lilies that can be used to buy items decorate your Royal Chambers. There are 32 Achievements to earn as well. Other extras include the ability to replay 18 Mini-games and 18 HOPS. There are 15 Wallpapers, Concept Artwork, Music, and Movies. There is a Bonus Chapter and a 54-page Strategy Guide. IMHO, this developer provides excellent value in their CE games with lots of collectibles and other extras to keep us happy. Winter Lily is a wonderful, different and version of the Snow White tale that I have read countless times since childhood. The Dark Romance is a favorite series of mine but there were two games that I really didn’t like all that much. As it stands right now Winter Lily might just be my favorite. Yes I know that many of you will think the game is cookie-cutter but realistically most HOPA and TM games are just that. I happen to be a game addict and it doesn’t bother me overmuch that most games follow a set pattern. In this case the gameplay is fun, the HOPS terrific, and the puzzles fun so I don’t mind the pattern. Even though I believe that Winter Lily is an excellent addition to the Dark Romance series, please try the demo to see if it is a game you will enjoy as well. Happy gaming! Rated 5 out of 5 by bmn5772 from WINNER WINNER BIG FISH DINNER! This game is beautiful.....graphics are so brilliant and the games are challenging and fun. I love this game, and you will too. Rated 5 out of 5 by rainworm from Some are not too good at aging..... Meet Snow White and her prince in this wintery game and beat the witch queen, who is after her and her new found love. In this variation of the tale only the purest heart can break the aging curse for witch queen Nivella, as her mirror tells her. She needs to destroy the bearer of this pure heart, Lily, Princess of Winterhelm. Winterhelm had already been defeated and Lily found refuge in a hut in the kingdom of Lanceya. Nivella is still after her, as the mirror told her, where to seek for the princess: in the kingdom of Lanceya, where William is king. We play two roles, as always. Starting as Lily, we meet the wounded king William and help him with a potion. But he and his people are threatened as well, as he has given shelter to refugee Lily. So, very soon after their first meeting, William has to leave for his castle. There Nivella has already taken action. With numerous entertaining puzzles and HOS, the story unfolds quite fast paced. It may be an adaption of Snow White, but after the introduction scene with Nivella and her mirror, we do not follow the original tale. Lily and William as protagonists are both sovereigns of their realms, Lily already defeated, William trying to protect his people. Nivella doesn't fight with an open visor, of course, as a witch she uses her supernatural powers. All you need in this winter season: a charming story with challenging features (puzzles are optional hard or easy), a magical atmosphere, which drew me in at once and the varied gameplay in 2 roles. A must-have not only for fans of the series and of course for me. Rated 4 out of 5 by tesamoine from Not sure about that Editors Choice, but... I love the Dark Romance games. This was no exception. You don't have to think much to play this series. Extremely linear games. I love going back and forth between the two characters. D.G. has become one of my favorite developers. There are lots of collectibles in the CE. IMO the bonus chapter was very short and not too enjoyable. If you're looking for a relaxing game that is fun and interesting, this is a good choice. Some voices were fairly annoying, but it is a fairy tale game. Rated 4 out of 5 by Yurnmesis from Trial: Mirror, Mirror…Shades of Snow White! Graphics were a little on the bright side, but excellent details and didn’t distract from the game. Sounds and music were fine. Characters were well designed and realistic. Hints transported which is always nice. 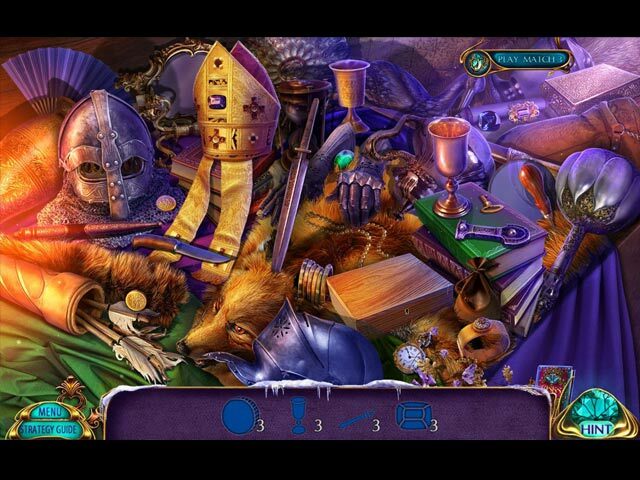 Hidden Object games offered clarity and no dark corners, interactive and instead of a childish picture book developers used a Hidden Object game where you find parts of an item to complete the story. Nice change! Mini Games were easy to hard, but well done and fans will enjoy. Morph and collect a couple items which turned out to be fun instead of spending too much time searching for them. The story switches between two characters, attractively crafted, to move their story forward. Save the Kingdom. Find your soulmate. It has all themes that are familiar but in this case the journey is enjoyable because of the fine craftsmanship and scenery as you move forward. I will consider purchasing this game. Give it a test trial, well worth your time. Rated 4 out of 5 by dancemom1 from Dang that mirror! Hello friends! Well, it looks like we have #8 in this series. As always, I review mostly on the game play and leave the story review to others who do a much better job than I. As usual with this developer, the graphics in this addition are exceptional. We still have the blur when going in and out of cut scenes and sometimes in other areas, but mostly very well done. Colors are bright and clear, but not over powering at all. Exceptional animation throughout, very realistic. Game play was excellent, with no problems during the demo. The voices weren't bad, but the fairy was extremely annoying and our Prince sounded rather wimpy. I just feel a Prince should have an accent. They are age appropriate and spoke with some emotion, except for the Prince...his voice was off-putting. As usual, I turn down the music, as I much prefer sound FX. I didn't notice that much music anyway. Sound FX, when we had them, are nicely done. HOPs are a fun variety of interactive lists, silhouettes, place item in scene, highlighted words, and match picture using the slider bars. Scenes are very clean and clear and items were not difficult to find. Very nice selection, so you don't get bored, but if you do, you can switch to a match 3 game. Puzzles were not difficult, but one did take a little thought to complete. We can still choose between easy and hard for the puzzles and the full game play as well, for those who want more challenge. Hint system is very helpful and it does transport to longer locations, by opening the map and showing you where your next move is going to be. Yep, my favorite map, very clear, areas are well marked and identified, and it shows you which location has a missed collectible. I find the Strategy Guide to be useful if I just can't find that elusive collectible. Collectibles are extremely well done, with challenge. We need to find 15 various artifacts that are quite small and hard to find in most cases; 48 pink lilies that we use to buy items for the boudoir; 12 chess pieces that are actually game characters, and which are easy to overlook. Nothing really jumps out at you, so be on the look out for them all. This game flowed very well and was easy to follow, but the story seemed to move slowly. Hopefully this picks up as the game progresses. This story was a bit of a twist on a very old story. I like how we switch characters and play both sides...kept things interesting. It did have some challenge, so it wasn't just a walk through. This is one of my favorite series and it just seems to get better with each game. No, I'm not giving it a 5, it isn't perfect throughout. Because of the blur and the slow story, I gave this one a 4.75. That said, I am going to add this one to my CE list, because I need to see where it goes and I liked it. I think most all levels of players will find this one entertaining and sometimes challenging. As always, try it for yourself and see what you think. We all have different tastes in games and you may not care for this one at all. Thanks for the reviews. Rated 4 out of 5 by nadaze2da from I'm grudgingly giving this game four stars Things I liked: Playing as two people, the collectibles, the mini games, interactive HOs, beautiful graphics and excellent voice overs. This twist on Snow White has everything you would want in romantic fairy tale. King William is drawn as a very hunky man and Princess Lily is stunningly beautiful. Wicked queen Nivella is a super-villain who seems to have prophetic insight into every move her opponents are going the make. We sympathize with the two young people who seem so endearingly good. 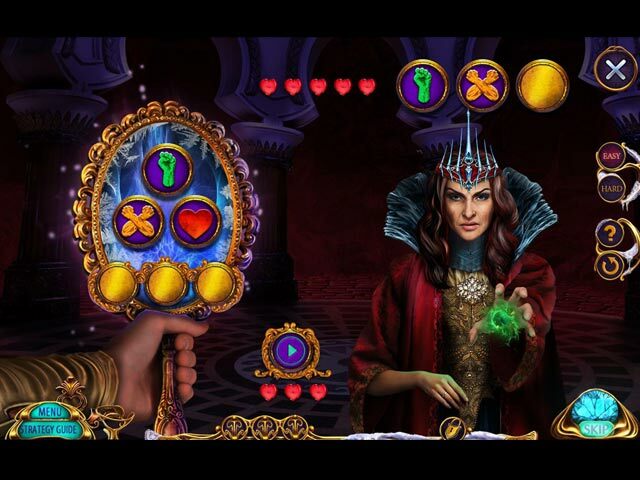 We despise the wicked queen for her evil quest to drain the life essence of Princess Lily. Things I hated: King William just can't stay out of jail. Why did Nivella imprison him each time and not just kill him? No story there I guess. Losing items immediately after their use and having to find another again. Instructions for mini games which were not very clear. Princess Lily who has been given actual "blue" blood. Imagine that! A somewhat muddy ending about the mirror. I thought obsidian was black, not green. I guess black may be over used....but isn't green also over used? Plot about evil entity overtaking something, anything.... world, body, essence - whatever. The irritating pixie voice of the fairy. I think every reviewer so far has mentioned that. I guess the things I hated may outweigh the things I liked but over all, The two future loves are perhaps made a little too sweet but this really is a solid game that doesn't make pretensions of being more than just a fairy tale. It is a game which makes you comfortable with the trite conventions we come in contact with in these games so frequently because you realize on some level it is just a fairy tale. Fairy tales give you an automatic sense of anything goes. You tend to overlook things which would normally irritate the heck out of you. As always, try before you buy. These reviews are opinions based on personal likes and dislikes. You should form your own opinion of whether to purchase it or not. I've learned to look for certain reviewers I think are more honest than some. Not all of us like sweetened tea. This game is a large mug full of sweetened tea. Rated 4 out of 5 by pennmom36 from DARE I SAY DARK ROMANCE IS BACK ON TRACK? Queen Nivella has been cursed to age at a wicked rate (me too, curse that princess!) The all revealing mirror has confirmed her diagnosis, wrinkleitis and acute grayhair-syndrome with a touch of baggyskinepidermis. Like most evil witches, the Queen has many powers, she can turn an ordinary dwarf into a stone zombie servant, but she's powerless against mother nature, <sigh>, aren't we all. But wait! If the Queen acts now, she can get two problems solved for the price of one, at the low low cost of only one very young, beautiful princess. Not just any princess, but a princess with a pure heart, a princess the Queen thought she had disposed of long ago, Princess Lily of Winterhelm. There's just one teeny tiny problem....Princess Lily has caught the eye of a very charming man, who just so happens to be King William of Lanceya! Ladies and Gentlemen, I do believe Dark Romance is back on track with this beautiful adaptation of Snow White! This is the only series I know of that successfully incorporates the feature of playing as both characters, switching back and forth between Princess Lily and King William. In this Collector's Edition version, the bling is plentiful, with hidden Dwarven Artifacts, hidden Chess Pieces and collectible Lily's that allow you to upgrade the Royal Chambers, and there are missing Journal Notes to collect as well. 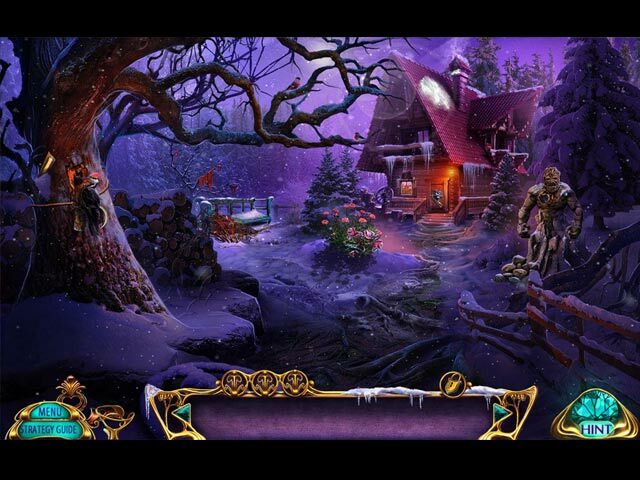 The Hidden Object Scenes are varied, and some of them are actually challenging! There are Keywords in Sentence finds, Interactive List finds, Silhouetted Shape finds and a newer style that requires you to adjust slider bars to align sections of sketches together. There is an alternate Mach 3 game available as well. The Mini Games are entertaining for the most part, and most of them are available in an Easy or Hard difficulty mode. Below are brief descriptions of some of the games you'll encounter during the demo: 1) Assemble the image by swapping sections of the disc shaped puzzle. 2) Move animal sections to a highlighted square to match the animal tile to the squares with matching outlines. 3) Land the dial on the correct symbol shown in the clue by choosing the number of moves and the direction of the dial. 4) Shoot down the chains by using 3 directional levers to align 3 sections of the cross-hairs over each chain. Then press the button when the horizontal and vertical bars are in the green zone. 5) Swap adjacent tiles to complete the image. 6) Recreate the symbols shown in the clue by clicking to fill in sections of the board. 7) Find 3 hidden shapes and then place the correct fragments into the snowflake, for each path taken in the forest. 8) Prepare a potion by following the recipe in the correct order. 9) Select arrow buttons on each column and row to place chips correctly according to the clue shown. 10) Move tokens along the tracks to their correct place. 11) Move the symbols to match the image on the clue, select discs to rotate select frames to swap tokens. DARK ROMANCE GAMES AVAILABLE Title***Collector's Edition Release Date***Average Rating 1-Vampire In Love (February 8-14) 3.9 2-Heart of the Beast (April 23-15) 4.0 3-The Swan Sonata (October 17-15) 3.4 4-Kingdom of Death (April 21-16) 3.4 5-Curse of Bluebeard ( October 13-16) 4.7 6-Romeo and Juliet (February 25-17) 2.7 7-The Monster Within (September 7-17) 4.0 8-Winter Lily (January 18-2018) n/a by Domini Games This Collector's Edition version has 15 Wallpapers, 20 Concept Art pictures (Domini Games never skimps on the CE bling!) 18 re-playable Mini Games, 18 re-playable Hidden Object Scenes, 28 re-playable Movie Videos, 5 Music Soundtracks, 30 Achievements to earn, 12 Hidden Chess Pieces, 15 Hidden Dwarven Artifacts, collectible Missing Journal Notes, 48 Lily's to upgrade items in the Royal Chamber's Boudoir, a built in Strategy Guide and a Bonus Chapter, enjoy! Rated 3 out of 5 by LunaNik from 3½ stars...This is a HUGE improvement. This is NOT a run-of-the-mill Domini game. While the graphics are still garish and the animation is still pixellated, the challenge level and originality of the gameplay has been stepped up immensely and the storyline is a unique riff on the Snow White story. Exploration still involves a laundry list of tasks, but the tasks are not silly; they have a purpose. You don't feel like you're just wandering around gathering items and fixing stuff for no reason; there's always a clear goal. HO scenes were much better than usual, with most of them being at least a medium challenge. Quite a lot of thought and innovation went into the puzzles. I played with all puzzles on hard mode, and most were of medium difficulty. Graphics were a mixed bag. On the one hand, the rendering was professional and quite beautiful with realistic textures. OTOH, the palette is still much to saturated and garish, and the in-game animation is extremely pixellated and blurry. Also, there was just too much animation that interfered with gameplay, including a multitude of slowly-moving cutscenes, banners for every little thing, and a complex animation every time an item was picked up. The soundtrack is quite lovely and evokes the game themes well. Voiceovers were mostly excellent, although I disliked the fairy's artificially high-pitched voice. Environmental sounds could have been more evocative, and I found the game sounds rather intrusive…lots of loud whooshing that was unnecessary. The CE bling is comprehensive: a bonus chapter about Nivella's childhood, the SG, numerous performance achievements, three types of collectibles (with indicators atop the inventory panel), replayable HO scenes and puzzles, wallpapers, concept art, soundtracks, and videos. Overall, I'm impressed that Domini has stepped up innovation in gameplay, the level of challenge, and attention to plot. I think there's still room for improvement, especially with the palette and animation, and with getting rid of the annoying banners and too slow cutscenes. I haven't decided whether to purchase yet, so I'll recommend that you play the demo. Happy gaming! Rated 3 out of 5 by campingramps from This seems like a good game but it tired me out This is one of those games that seems to start just fine but then the tedium sets in. You play as two people and that is where the fun ends. Switching between the two you also wear yourself out running back and forth retrieving articles to get other articles and on and on. Graphics are nice and the characters are well drawn and enjoyable and the story moves along although slowly. HO's and mini games are fun and challenging and a joy to play but that is where the pros of this game end. I kinda sorta recommend this game and I may put in my stable but I'm on the fence. Play the demo and don't go just by reviews. Rated 2 out of 5 by Maniactree from Disappointing Game I usually love the Dark Romance series, but I found this one to be really boring. I haven't even made it through the game yet and I am giving up. There is way too much talking. I can't stand the voices used, especially the fairy. Good grief. Could it be any more high-pitched? Like nails on a blackboard. And it is so slow moving, I have totally lost interest. What a disappointment. Rated 2 out of 5 by Granny_Gruff from Is it a Romance If the Two Just Met and Went Their Separate Ways? So King, Princess, Fairy, Dwarves, and wicked Witch-Queen all rolled up together in a tale rumored to be a take off on Snow White, off being the key word. 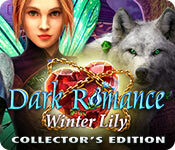 You play as both Lily and William, alternating between the two as in earlier Dark Romance games. Good stuff: HOPs with a Match-3 alternative, Puzzles, collectibles, CE bling and a story of sorts. Bad stuff: If another reviewer hadn't pointed out that this is meant to be a take-off on Snow White, I wouldn't have known that. And apparently it is possible to make a fairy tale be really annoying and this is the one for me. The Wicked Queen is over the top, the two main characters are too much all together. Lily is supposed to be hiding out in fear of her life and opens the door at the first knock. King William seems to be unable to function in his role - He enters a "secret" passage that not only the guards, but wicked Queen Nivella all know about. He gets to the end and walks right into the Queen's henchman and is once again imprisoned. The Fairy has a high pitched voice and is just too precious. The alchemist is once again a magician rather than an alchemist. He has to have a special potion found for him to "recover" from his last experiment and then has Lily concoct a curse cure because he is still stiff from his mistake. As soon as she is done, he turns into a large bird and flies off with the aid for William. Stiffness must not apply to wings. I felt as though I'd stepped into a middle school game. Everything including the color palette was over the top. I pass. Please try the demo for yourself. Rated 2 out of 5 by JPOlafson from a messy game Dark Romance Water Lily good luck getting it to work..I can't get the game to stay on more than 5 seconds. tried to get help and they keep putting the wrong game up to help me with.. Rated 1 out of 5 by SuperOmmi from Has to be the most ridiculous game I've ever played Based on completed game and bonus chapter: I got this game on a BOGO day without trying the demo because I usually really like this series. The last one was a total dud so I figured this one would have to be better... NOT. This one is worse. I'm very disappointed. It was ridiculous from beginning to end. The problem was not in the game play: puzzles were good, HOs were good, artwork was stunning/gorgeous. I really liked decorating the royal chamber with items you get by finding collectibles. I also liked that you could put the puzzles on hard or easy. The voice-overs were mostly good. (Except for the little fairy helper in the beginning. Her voice was annoying.) The problem of this game was in a total lack of any kind of logic at all... Who puts a bottle of acid in a pile of ashes in an outdoor fireplace? Why would a bottle of sleeping potion just be lying around the guard station for any old person to find it? Why would an intricate hiding place inside a column be hiding a candle wick? How would you even know to look for a wick there? Why would you hide what you need to open your front door inside of a wall? The list of this kind of nonsense goes on and on. I think the devs just stopped trying to give this game any sense at all. In addition, the story line was so off-the-wall... Why would the king of a nation be riding around alone on a sled without any retainers? Why would the king/queen be running around doing things that they would have soldiers do? WHERE were the other members of the court? OMG. There was so much ridiculousness that I could not suspend disbelief. The bonus chapter was a prequel: background story for the big baddie in the main story. Meh. More of same nonsense. I don't understand the stellar reviews for this game at all. Please try the demo for yourself.